But can dogs eat watermelon safely? Thankfully for your thirsty pooch, you can give them some quenching watermelon after a day spent running around in a sunny park. 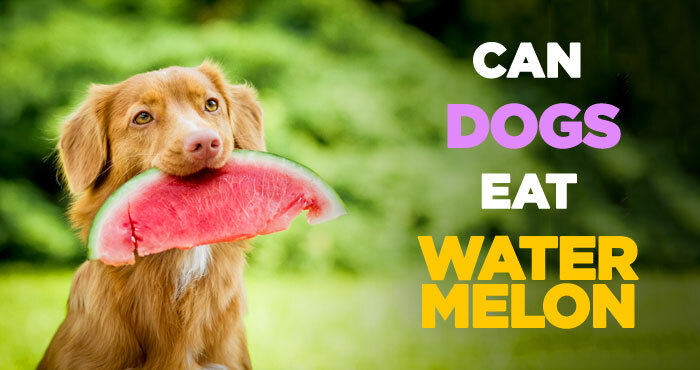 Watermelon is, after all, 90% water (the name may not be creative, but it is helpful), making it a great way to keep your pet hydrated with a treat they love. Just remember to follow a few simple precautions and avoiding giving them too much of a good thing. Whereas watermelon is not hazardous for the same reasons as grapes (which are toxic to dogs) or cherries (which have large indigestible stones), there are a few possible health issues to be avoided. This guide will instruct you on how to give your dog all the vitamins and sugar-free sweetness of watermelon with none of these health issues. Is Watermelon Good for Dogs to Eat? Dogs, especially those with big, fluffy coats need a lot of hydration during the warmer months. 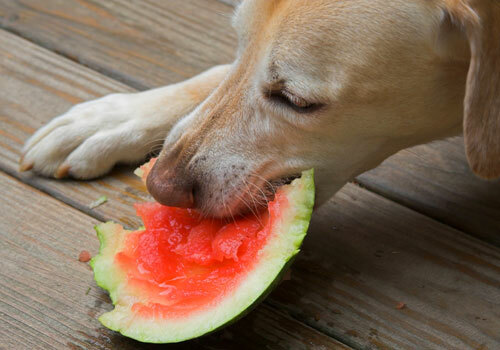 A watermelon can be a perfect, hydrating solution for your thirsty pooch. However, be mindful of the portions you provide and the way you serve it up. 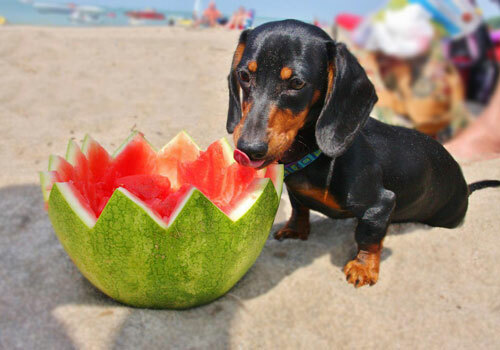 When dogs eat watermelon, they get a lot of its healthy vitamins. The tasty fruit has so many good ingredients like beta-carotene, magnesium, vitamin A, potassium but, most importantly, it’s very rich in vitamin C.
Even though dogs can produce their own vitamin C, additional dosages of it improve the immune system massively. 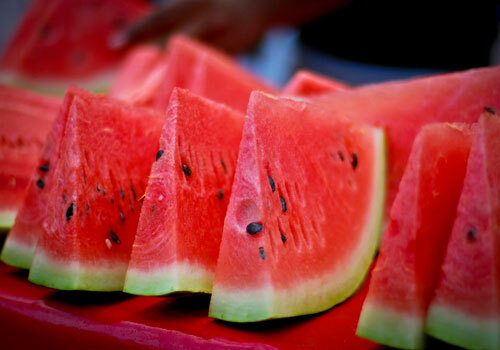 A combination of watermelon and dogs also means a healthy coat, thanks to the vitamin A in it! There’s also a lot of vitamin B-1 (normally referred to as thiamine) which keeps your pooch sharp and improves their reflexes massively. As we mentioned before, watermelon is 90% water, so there are no fattening ingredients in it whatsoever, which makes it a very healthy treat. Furthermore, dogs just love the taste of it – there’s a reason why there’s also watermelon-flavored treats on the market! Watermelon is a great source of hydration of your dog as well. Watch out for the signs of dehydration and, if you see any of them, give your pooch some of this tasty fruit if you have it lying around. It will make them feel better in minutes! Another great feature of watermelons is that all their sweetness comes from natural sugars, so dogs with health problems who can’t consume processed sugar can indulge freely! To sum up, we’ve discovered that watermelon is jam-packed with good ingredients, very good for keeping hydration levels up and is very healthy and non-fattening for dogs. However, can it all be that perfect? Afraid not. As with any other food, all owners should be cautious when presenting a new source of sustenance for their furry friend. 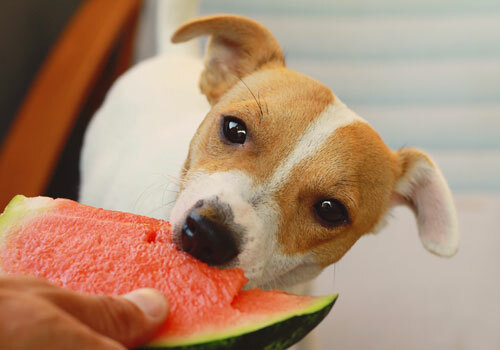 Read on to find the reasons why watermelon might be bad for dogs and what to do to ensure your pooch enjoys their life (and their watermelon) to the fullest. Why Is Watermelon Bad for Dogs? The answer to that question is a no, despite what your fitness expert might be telling you. 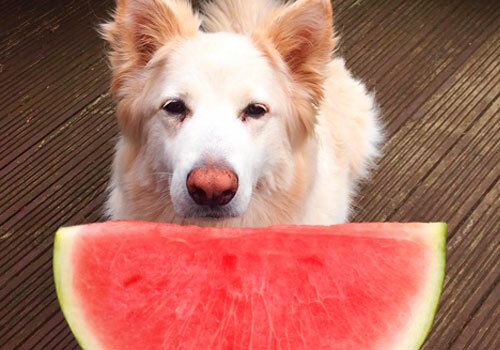 While it is now a big health fad to eat watermelon rind, it’s actually very bad for your pooch. Feeding them the rind – no matter if it’s chopped or ground up or anything else – is basically asking for gastrointestinal problems for your dog. Not to mention that the rind is in all cases very hard on dogs’ teeth. Therefore, you need to always be mindful of your pooch rushing to eat watermelon because they will try to chew on it. Don’t let them, as it might lead to an emergency trip to the dentist. Dogs normally have a very hard time digesting watermelon rind so giving them any in any shape, size or form will just make them feel bad. Besides, it doesn’t hold any of the health benefits that it does for humans so giving it to your furry friend just seems pointless. 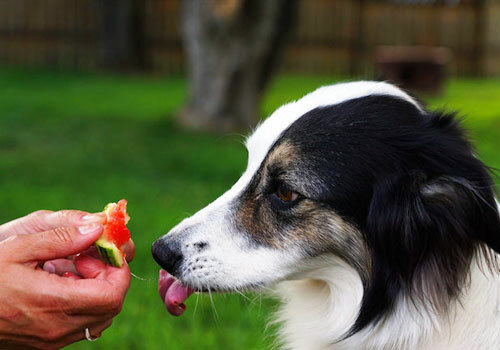 Another thing that could be a problem for dogs’ digestion are the seeds in watermelons. Just like the rind, they’re very hard to digest and can present a choking hazard as well. While seeds are not as big as pits in other fruits (e.g. cherries), there’s still the danger of intestinal blockage. It’s because a lot of them can pile up really quickly and block things that should never be blocked. Finally, as we know from other nutrition guides, too much of anything is always bad. If you see your dog displaying signs of distress or food poisoning (like vomiting or diarrhea) after your dog eating watermelon, you shouldn’t give them anymore. It’s possible that your pooch’s stomach just isn’t very suited for the tasty, filling treat. Raw watermelon for dogs isn’t always a winner, however, there are a lot other fruity treats you can give to your furry friend just fine. How To Prepare Watermelon For Dogs? 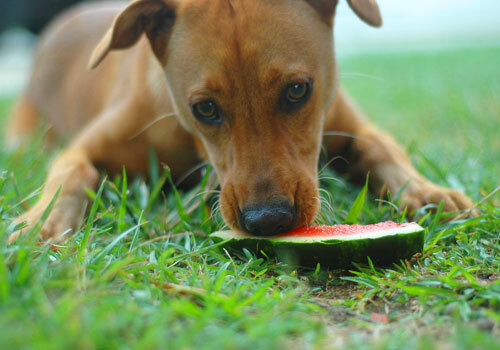 Don’t worry – you still can feed the juicy, thirst-quenching fruit to your pooch without endangering their health! You just have to take extra measures and precautions to make sure that none of the things that your dog can’t digest go anywhere near their mouth. First of all, clear all rind and seeds from the watermelon. We already talked about the rind but it’s worth repeating that it doesn’t actually carry any nutritional value for dogs, and it’s very hard on their stomachs and teeth. All seeds of the watermelon need to be cleaned – even if they’re really tiny, and you think they won’t do any harm! One or two really won’t, but more than that will clog up your pooch’s digestion. Also, sometimes seeds can cause food poisoning, like the seeds in oranges. A note about seedless watermelon, even if you think you can’t see any seeds, make sure to double- and triple-check it. While seedless watermelon doesn’t have the black, hard seeds that might give your pup intestinal blockage, they still have seeds – only this time they’re white and nearly transparent. These seeds may be less likely to cause an intestinal blockage (mainly because there’s less of them and they’re a lot lighter) but it’s still recommended to clean them. Better be safe than sorry! Finally, as with all new food for dogs, all should be in moderation. Start with only a few slices at a time – don’t let your pooch munch on too much of the sweet fruit! My Dog Ate Watermelon Rind! What Should I Do Now? If your dog’s stools get really loose, that’s a sure sign they’ve had too much. Stop giving them watermelon for a while and feed them their regular diet. If your dog’s digestion doesn’t improve, then the watermelon and dog combo is probably taking its toll, and it’s time for a visit to the vet. Watermelon for dogs is only good when it doesn’t interfere with their normal eating habits. That’s why you should always feed watermelon to your dog either an hour before their regular meal or two to three hours afterwards. The reason for that is that watermelon is very sweet and filling as all the water in it can create a false sense of a full belly. You don’t want your dog missing their regular meals because they’re so full of this delicious fruit! 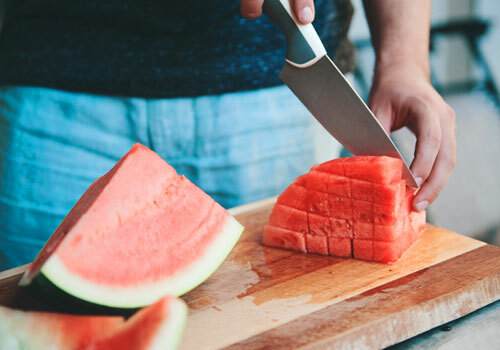 Overeating on watermelon (or any kind of melon, really) will cause loose stool, but that should be remedied with solid food and a normal diet for two or three days. Also, watch out on your dog gorging on watermelon smoothies or watermelon fruit salads. Smoothies often contain sugar and dairy – two very bad things for dogs, while fruit salads might contain other fruit that are bad for dogs, like grapes. If you’re unsure about even the smallest detail, always consult your vet before feeding your dog watermelon. Dazzled by all this watermelon and dogs info? 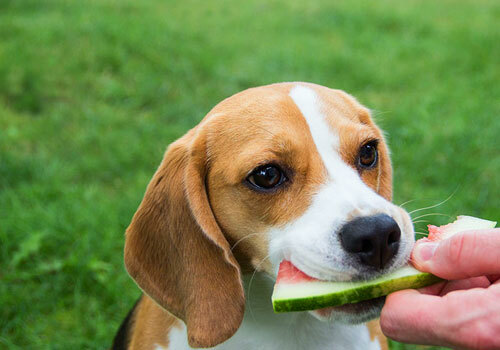 Be dazzled no more – we’ve compiled a handy TL;DR list of the most important tips you need to know about feeding your dog watermelon. If you can think of any questions that we haven’t answered here, feel free to include them in the comments below! 1. Can dogs have watermelon? Is Watermelon Ok for Dogs? Yes. 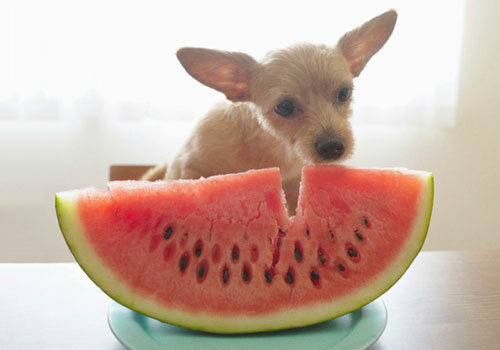 Watermelon is perfectly safe and even, in moderate quantities, very healthy for all dogs! They love it too because it’s jam-packed with healthy vitamins and natural sugars. It’s also about 90% water, so great for keeping hydrated on the warmer days! 2. Can dogs eat watermelon seeds? That’s a big no. While not as destructive as cherry pits, watermelon seeds can clog up a dog’s digestion easily as there’s a lot of them. They can also get lodged in your dog’s teeth, which might lead to teeth damage. Always remove them before feeding watermelon to your dog. 3. Can dogs eat white watermelon seeds? Yes, but it’s best if they don’t. White watermelon seeds aren’t as hard as the black ones, but they can still block your dog’s digestion. They’re quite hard to see sometimes but if you can clean them as well as possible before giving watermelon to your dog. Don’t risk a blocked and fussy stomach. 4. Can dogs eat watermelon rind? Is Watermelon Rind Good for Dogs? While some health gurus might proclaim that rind is incredibly healthy to humans, it has absolutely no nutritional benefits for dogs. In fact, rind can cause major blockage to your dog’s digestive system and damage their teeth horribly. So essentially, avoid rind at all times. 5. How much watermelon can a dog eat without getting sick? And how often? It’s always best to have one or two slices at a time at most. While incredibly healthy in moderate quantities, excess watermelon can make dogs feel ill. Treat the watermelon like a luxurious treat. It’s best to give it once or twice every two weeks and to always do it an hour before or two hours after your dog’s regular meals. 6. Does watermelon give dogs diarrhea? Only if it’s in excessive quantities. Dogs generally react very well to watermelon and you might notice them urinating more often because of the high water content. Diarrhea only happens if there’s a digestive problem as a result of the watermelon. If that happens, stop giving your dog watermelon and if the problem persists, consult a vet. 7. Can puppies eat watermelon? There’s nothing harmful in puppy eating watermelon, however, they should be old enough to digest solid foods. That’s normally puppies that are over six months old. Puppies under that age should be kept on a strict diet of puppy food to help with their growth and development. So what have we decided – is watermelon a fruit or a vegetable? Well, no one really cares about that. More importantly, can dogs eat watermelon? The answer is a solid yes. Watermelon has a lot of healthy nutrients and a high percentage of water that is very beneficial, especially in warmer climates. It’s also a lovely, non-fattening sweet treat for your pooch at any time of year. There’s just a few precautions that need to be taken – always clear the watermelon of all seeds and rind and make sure to not give too much of it at once, just one or two slices. Finally, time it right so that it doesn’t interject with your dog’s regular meals. And remember, if you notice any changes in your dog’s behavior or health always consult a vet! Follow these dogs and watermelon guidelines to the letter and you will have a happy, satisfied pooch, leading a much sweeter life!